Trump has long dismissed the Mueller “Russia Gate” investigation as a hoax and witch hunt while continuously casting doubt on whether the Russians ever meddled in his election. The sham of the President’s position was recently exposed with the indictment of 13 Russians and 3 Russian companies for doing exactly what Trump for so long has tried to suggest didn’t happen. I will list all the convictions and indictments secured so far by Mueller. 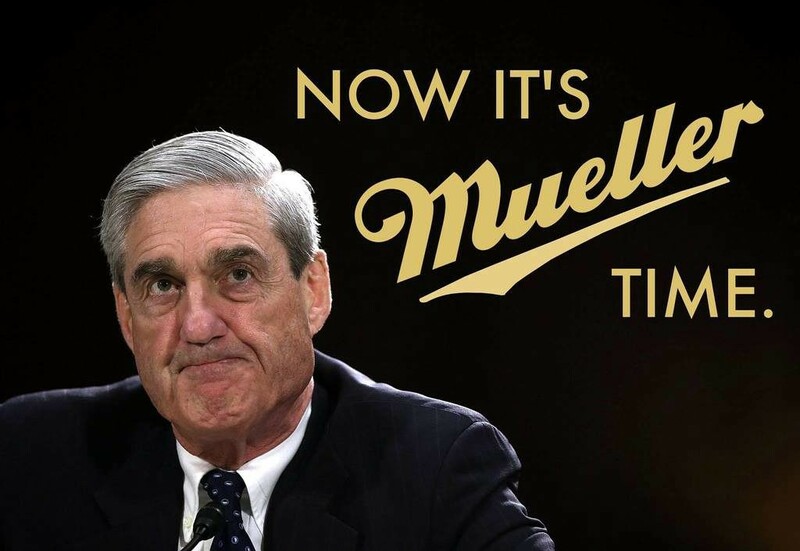 So far, Mueller’s team has at least eight convictions, 29 individual indictments and 3 corporate indictments to its credit. I will update and add to this list as more indictments or convictions occur. George Papadopoulos: Former Trump Campaign Foreign Policy Advisor, continued in that role after Trump became President. Convicted October 5, 2017 for lying to the FBI regarding communications, on behalf of and with the encouragement Trump Campaign, with Russians aimed at getting dirt on Hillary Clinton from Russian hacked emails. Was arrested July 27, 2017 but the conviction and plea agreement was not released until October 30th. In the interim he continued to work in the Trump Administration and may have been wearing a wire on behalf of the Mueller team. On August 31, 2018 George Papadopoulos files a “sentencing memorandum,” essentially a brief, seeking leniency because of the value of his cooperation to the FBI. He states that he told the FBI that in the March 31, 2016 National Security Meeting (see entry for that date above) that in regards to his suggestion that Trump meet with Putin during the campaign, Trump nodded in approval and Jeff Sessions “appeared to like the idea and stated that the campaign should look into it.” This contradicts Sessions’ sworn testimony to Congress where he claimed to have pushed back on the idea. The sentencing memorandum also states that Papadopoulos told the FBI “he was unaware of anyone in the campaign knowing of the stolen Hillary Clinton emails prior to the emails being publicly released.” However, this was in the section of memorandum captioned “George Papadopoulos Lied to the FBI.” On September 7, 2018 George Papadopoulos is sentenced to 14 days in prison and a year of supervised release. Michael Flynn: Former Army General, Trump Campaign Advisor, led “lock her up chants” as a keynote speaker at the Republican National Convention, appointed by Trump as National Security Advisor and Director of National Intelligence, perhaps the most sensitive position related to national security in the Administration. Convicted (by guilty plea) on December 1, 2017 for lying to the FBI and regarding contacts and communications with Russians on behalf of the Trump transition team. The plea bargain agreement requires that Flynn fully cooperate with the investigation. It gets worse. The judge later twice asked if Flynn could have been charged with treason before walking those comments back. The judge repeatedly suggested Flynn delay sentencing until his cooperation was complete. At first Flynn declined but the judge gave him a recess to talk it over with his attorneys. His attorneys, realizing the hearing, was a disaster wisely accepted the opportunity to put some distance between it and Flynn’s sentencing. The sentencing was delayed with a status report set for March. Richard Pinedo: California man convicted February 2, 2018 for helping the indicted Russian individuals and companies in their meddling in the Presidential election. Pinedo helped the Russians use dummy bank accounts to work around the security of companies like PayPal. Pinedo helped the Russians appear online as if they were Americans. Pinedo is now cooperating with Mueller’s team. Alex Van der Zwaan: The son-in-law of a Russian oligarch pleads guilty on February 20, 2018 for lying to the FBI regarding his communications with Rick Gates and Paul Manafort on behalf of pro-Soviet elements in the Ukraine. The communications involved were in September 2016, shortly after Manafort left the Trump Campaign and while Gates was still part of the campaign. On March 27, 2018 Mueller files a Sentencing Memorandum with the court for Van der Zwaan. This document details communications, some of which were recorded, between Gates, Manafort and a Russian intelligence agent. This conviction, along with an expected plea agreement with Rick Gates (see below), is seen as evidence that the Mueller’ noose is tightening around Former Trump Campaign Manager Paul Manafort’s indictment. On April 3, 2018 Alex van Der Zwaan is sentenced to 30 days in jail and fined $20,000, becoming the first person sentenced in the Russia investigation. Paul Manafort: Found guilty by a jury on August 21, 2018 on eight counts of 18 against him. A mistrial was declared due to hung jury on the remaining ten charges. An interview with one juror revealed there was a single Trump supporting hold out against finding Manafort guilty on all charges. Manafort was found guilty of five counts of tax fraud, two counts of bank fraud and one count of hiding foreign bank accounts. Manafort was originally hired by Trump in the crucial role of securing delegates for the Republican National Convention then made Trump’s Campaign Chairman. A second trial on additional charges remains pending. Fired abruptly after a NY Times report describing massive possible illegal financial transactions from pro-Russian groups in the Ukraine. Indicted with Rick Gates on October 30, 2017 on charges of conspiracy against the United States, conspiracy to launder money, unregistered agent of a foreign principal, false and misleading FARA statements, false statements, and multiple counts of failure to file reports of foreign bank and financial accounts. On September 14, 2018: Manafort pleads guilty to two counts related to his second trial. Those counts are for Conspiracy to Defraud the United States and Conspiracy to Obstruct Justice. The second of those is related to his efforts to tamper with witnesses while his trials were pending. In addition, Manafort stipulates that all the facts alleged by the government are true. 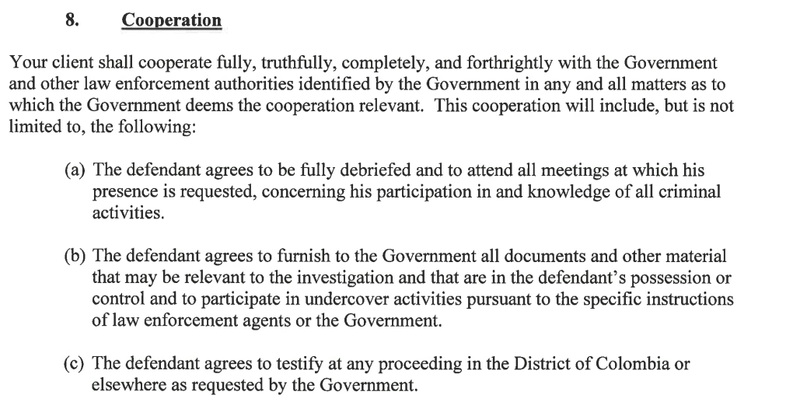 The deal includes a cooperation agreement requiring Manafort’s cooperation in regards to whatever prosecutors want to ask about. Here’s a screenshot of part of the relevant material from the cooperation agreement. On February 13, 2019 the judge in Manafort’s case rules he intentionally lied multiple times when he was supposed to cooperating with prosecutors. The judge rules “the Office of Special Counsel is no longer bound by its obligations under the plea agreement, including its promise to support a reduction of the offense level in the calculation of the U.S. Sentencing Guidelines for acceptance of responsibility.” On February 15, 2019 Mueller recommends that Manafort be jailed for 20–24 years. On March 7, 2019: Judge T.S. Ellis sentences former Trump Campaign Manager to 47 months in prison for convictions by jury related to bank and tax fraud. The sentence attracts controversy as it is well below sentencing guidelines for the offenses. On March 13, 2019, in a complicated sentencing decision (some serving concurrent, some not), the judge in Manafort’s second case adds nearly four additional years for his time prison. She does give credit for time served, sending Manafort to just under seven more years in jail. Michael Cohen: On August 21, 2018 pleads guilty as part of a plea bargain on 8 counts. Two of the counts include campaign financing violations related to hush money payments to Karen McDougal and Stormy Daniels. Cohen states the violations were made “in coordination with and at the direction of” President Trump. The Statement of Offense, that Cohen basically confesses to, details a stunning process of deliberate collusion between the Trump Campaign and AMI (the parent company of the National Enquirer) to suppress negative stories about Trump. I’m including Cohen in this list even though the plea deal was not with Mueller, but the Federal Prosecutors for the Southern District of New York, because it started with Mueller and was referred by Mueller to that office. Cohen lied in stating the project ended in January of 2016, before the Iowa caucuses, when in fact discussion for the project continued with the Russians into June 2016. Those discussions included Trump and undesignated family members of Trump. Cohen lied when he told Congress he never travelled to Russia regarding the potential deal and lied when he told Congress he never considered asking Trump to travel to Russia regarding the deal. In fact, Cohen agreed to travel to Russia in May 2016 to continue discussions related to the deal and took steps to plan for Trump to travel there too. Cohen lied when he told Congress he never recalled any Russian government response or contact regarding the Trump Tower Moscow project. In fact, Cohen knew he did receive responses from the press Secretary for the President of Russia and talked to others about those contacts. “made the false statements to (1) minimize links between the Moscow Project and Individual-1 (Trump) and (2) give the false impression that the Moscow Project ended before the Iowa caucus and the very first primary, in hopes of limiting the ongoing Russia investigations. Samuel Patten: On August 31, 2018 pleads guilty to violating the Foreign Agents Registration Act (FARA) and enters into a full cooperation agreement with government investigators. Patten’s Statement of Offense details a scheme whereby he worked with Manafort protege Rick Gates, and a straw purchaser, to illegally funnel foreign money to then President-elect Trump’s Inauguration Committee. Patten also admits to lying in his testimony to Congress regarding these matters. Patten’s Statement of Offense expressly states that it does not include “all the facts known to the parties concerning the charged offense and covered conduct.” While the Statement of Offense suggests many more charges could have been brought, the plea agreement reduces it to a single count for the FARA violation. This suggests Patten has provided very useful information to the government that we don’t know about yet. While the plea agreement was actually struck with the United States Attorney’s Office for the District of Columbia, I am including it here because the matter was originally referred to them by Special Prosecutor Mueller’s office. On April 12, 2019 Judge Amy Berman Jackson sentences Sam Patten to probation. The judge followed the recommendations of prosecutors for no prison time. The leniency was based on the value of Patten’s contributions to several ongoing but still undisclosed investigations. INDICTED: 31 Individuals and 3 Corporations. Konstantin Kilimnik: This Russian spy/intelligence operative was added to the indictment list via a superseding indictment including Paul Manafort on June 8, 2018. Manafort and Kilimnik are accused of wide ranging conspiracies to defraud the United States, FARA reporting violations, money laundering, bank and wire transfer fraud and tax evasion and witness tampering while Manafort was on bail. Manafort employed Kilimnik in his company to lobby for pro-Russian candidates in the Ukraine. 13 more Russians and Three Russian Corporations. Indicted on February 16, 2018. The indictment alleges the Defendants’ “operations included supporting the presidential campaign of then-candidate Donald J. Trump and disparaging Hillary Clinton.” The indictment alleges specific violations of FARA, wire and bank fraud, and identity theft (to allow them to pose as real Americans). One of the Russian social media accounts was Twitter account @Tenn-GOP which claimed to be the “Unofficial Twitter account of Tennessee Republicans.” Both Kellyanne Conway and Trump Junior followed that Russia meddling account and retweeted it. The indictment focuses on “The Internet Research Agency,” it’s employees, and shell corporations. The Internet Research Agency itself. Concord Management: shell corporation for The Internet Research. Concord Catering: shell corporation for The Internet Research Agency. Yevgeny Prigozhin: The head of the Internet Research Agency and financier of the conspiracy. The object of the conspiracy was to hack into protected computers of persons and entities charged with the administration of the 2016 US. elections in order to access these computers and steal voter data and other information stored on these computers. The indictment alleges that the Russian GRU, acting as Guccifer 2.0, funneled the stolen information for Wikileaks for release. Wikileaks at least knew the material was stolen, and volunteered to the Russian GRU that it would be better means of releasing the information than Guccifer. The indictment alleges Wikileaks and Guccifer coordinated the release to information to most damage the Clinton Campaign and thereby help the Trump Campaign. As for the stealing of voter data, the indictment alleges the GRU successfully hacked at least one states stealing information on about 500,000 voters that included their, names, addresses, partial social security numbers, dates of birth, and drivers license numbers. This series of indictments comes closer to the Trump Campaign than many realize. Viktor Netyksho: Commander of Unit 26165. Boris Antonov: Member of Unit 26165 and Head of the Department dedicated to targeting military, political, governmental, and no-governmental organizations with spearphishing emails and other computer activities. Dmitry Badin: Member of Unit 26165. Ivan Yermakov: Russian military officer assigned to Unit 26165. Used various online personas including “Kate S. Milton,” James MocMorgans,” and “Karen W. Millen” to hack email accounts. Alesky Lukashev: Member of Unit 26165 assigned to Antonov’s department. Sergey Morgachev: Member of Unit 26165 in charge of department using the malware hacking tool “X-Agent” used to hack Democratic networks. Pavel Yershov: Member of Unit 26165 assigned to Morgachev’s department. Artem Malyshev: Member of unit 26165 assigned to Morgachev’s department. Used a variety of online monikers includeing “djangomagicdev” and “realblatr.” Responsible for monitoring the X-Agent malware implanted in the systems of the DNC and other Democratic organizations. Aleksandr Orsadchuk: Russian military Colonel commanding Unit 74455. This unit was responsible for releasing stolen documents through the DCLeaks and Guccifer 2.0 personas and the publication of anti-Clinton propaganda on social media accounts operated by the GRU. Aleksey Potemkin: Supervisor of a Department in Unit 74455. Anatoliy Kovalev: Member of Unit 74455 involved in the hacking of state election computers and databases. On October 19, 2018 the Mueller team unsealed a new indictment against a Russian named Elena Alekseevna Khusyaynova. The 38 page criminal complaint details extensive Russian troll farm social media meddling efforts in both the 2016 and upcoming 2018 midterm elections. “Project Lakhta”, as the Russians called, employed hundreds of people, with a budget of tens of millions of dollars, that since 2014 operated with the stated goal “to spread distrust towards candidates for political office and the political system in general.” Khusyaynova acted as the Chief Accountant for the operation, paying those considerable bills. The depth, breadth and sophistication of the Russian troll farm efforts is detailed with dozens of examples of social media posts, memes, and often incredibly detailed instructions given employees on how to be most effective in advancing that stated purpose. On December 17, 2018 (the eve of Michael Flynn’s sentencing hearing) indictments are filed against two of his associates for FARA violations and lying about it. The indictment alleges the named defendants, Bijan Rafiekian and Kamil Alptekin, engaged in lobbying in the United States directed at extraditing a Turkish citizen, Fethullah Gulen, to Turkey. Turkish President Erdogan regards him as the leader of a failed coup attempt. Flynn is (identified as “Person A” in the indictment) and his company (identified as “Company A”). The indictment describes Flynn as writing an editorial on behalf of the Turkish government on election day. The indictment details the involvement of Flynn’s company, and his associates, as working with the government of Turkey to conceal their illegal lobbying efforts even after Flynn was serving as National Security Director. On April 11, 2019 attorney Greg Craig, formerly White House Counsel in the Obama Administration, is arrested and indicted on charges he lied about assistance he provided to Trump Campaign Chairman Paul Manafort when committing some of his crimes.